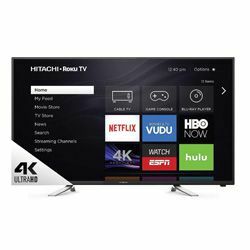 While testing Hitachi 43R80 vs TCL 43S517 I’d like to compare two budget models - Hitachi 43R80 from R70 series (2017) and TCL 43S517 from S517 one (2018). Hitachi 43R80 appeared one year earlier, but it is still more expensive than TCL 43S517. Both units have VA displays with a narrow viewing angle that is not the TVs’ but the tech’s issue. Hitachi 43R80 has High-efficiency Liquid Crystal Display to enhance resolution and energy efficiency jumped by 3 times. TCL 43S517 has a brand NBP Photon tech to provide wide color space coverage. Hitachi 43R80 and TCL 43S517 are 4K smart TVs to watch high-quality 4K content. Hitachi 43R80 has a direct backlight tech to make the contrast better. TCL 43S517 provides a great color reproduction and accuracy due to a small Delta-E rating. It also supports Dolby Vision HDR that increases the dynamic range, makes bright colors brighter and dark shadows darker. While checking TCL 43S517 vs Hitachi 43R80, the necessity of the external speakers became clear because of lack of bass and poor volume. Hitachi 43R80 has twice faster frame rate than TCL 43S517 (it has only basic 60Hz) to reduce motion blur completely and to deliver great fast-movie experience. TCL 43S517 43R80 is based on the Roku TV platform that delivers plenty of apps and content to enjoy whatever you want and the opportunity to manage from the smartphone TV via Roku mobile app. The TV doesn’t support HDR10 for gaming. Either Hitachi 43R80 or TCL 43S517 are both Wi-Fi and Ethernet capable to provide backup for Internet connection. Both TVs are flat and have a removable side stand that looks different – Hitachi 43R80 demonstrates silver finish versus TCL 43S517 common glossy black design. However, TCL 43S517 has an extremely narrow bezel and a partially metal back panel that makes the TV look very stylish. Both units are sleek and have a sturdy building. Very easy and logical menu for input units. Some problems with a yellow color while using the TV as a replacement for a monitor. The TV can be connected to a laptop as a wireless display. Built-in Netflix allows watching content without toggling between the TV and console. The second USB and the fourth HDMI ports would be great. Some unwanted brightness in the corners of the screen.